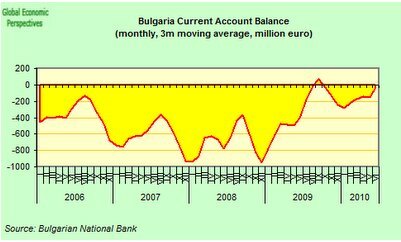 As the IMF say in their most recent staff report on the country, the aftermath of the recent severe economic crisis leaves us with the question as to whether potential output growth in Bulgaria in the years to come is going to be markedly lower than it was during the boom years. As the IMF point out, the current recession was preceded by an investment boom in construction, real estate and the associated financial sectors. 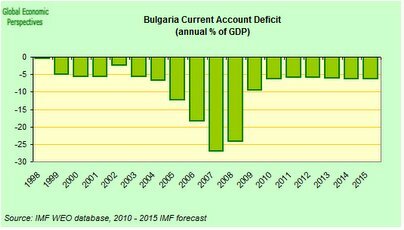 Now that the boom (which was always unsustainable, Bulgaria's current account deficit in 2007 hit almost 27% of GDP) is well and truly over in these sectors, the strong associated decline in investment could have large negative effects on output. Moreover, it will take considerable time before the excess labor and resources that are no longer needed in these sectors can be absorbed by other sectors, which suggests that the rate of unemployment may rise yet further and remain higher for some considerable time. Not a uniquely Bulgarian story, but none the less important for that. 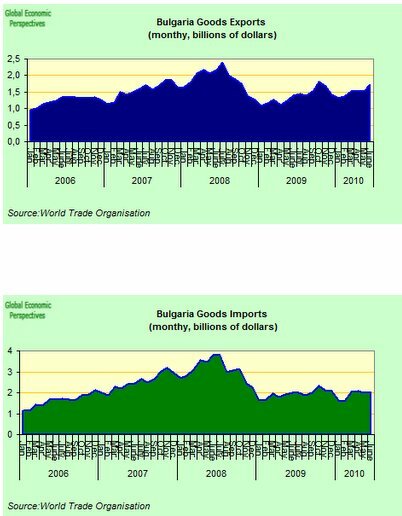 Following several years of strong increases (around 6% a year) Bulgarian growth declined sharply in 2009 when the economy was hit hard by credit squeeze which formed part of the global economic and financial crisis. Capital inflows, which had been keeping the current account deficit afloat, dropped from a peak of 44 percent of GDP in 2007 to less than 10 percent of GDP in 2009. As a result, investment, which had risen by over 20 percent annually during the previous two years, fell by nearly 30%. And as the investment flows dried up, the Current Account deficit closed rapidly, as imports (and domestic consumption) dropped back sharply. Employment also started to fall, while the unemployment rate rose rapidly, hitting a seasonally adjusted 9% in March and April this year, according to Eurostat seasonally adjusted data. The question the IMF ask, about whether Bulgaria will be able to return to the high growth rates of 2001–08 is no idle one, since with a shrinking and ageing population, and an external debt which stands at around 110% of GDP, sustainability in the medium term means finding a level of growth which can enable to country to pay down its debt and support its pension and health systems. And this will be no easy task, given that the early strong revenue flows from domestic consumption (VAT) have now fallen sharply and are unlikely to rebound as the country becomes increasingly export dependent for growth, and exports don't have VAT attached. Again, this isn't only a Bulgarian problem, but it is there as an issue. Recent changes in pension system parameters and contribution rates have also put significant pressure on Bulgaria's pension finances. 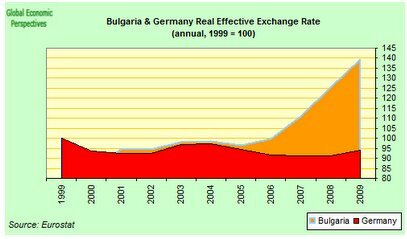 During the years 2003 to 2007 total revenue surged by about 51 percent and Bulgaria experienced the strongest rise in its revenue-to-GDP ratio among the new EU member states (about 4½ percent of GDP). This sudden increase in income encouraged the Bulgarian authorities to offset part of the additional revenue by lowering social security contributions. Rates were cut by 6 percentage points from 2002 to 2007 (for the pension and unemployment funds) and there was a further 2.4 percentage points reduction in 2009. As a result budget financing of the pension system has risen sharply during the recession. Before 2008 budget transfers to close the financing gap of the pension fund had averaged about 3 percent of GDP. This increased to about 5 percent of GDP in 2009 and for 2010 the budget anticipates a transfer of more than 6 percent of GDP. And if there is not a sharp rebound in domestic consumption (which in all probability there won't be) these shortfalls become structural, not cyclical, and solutions will need to be found. Apart from the obvious demographic impediments the country faces, there are other reasons to think that getting back to moderate sustainable growth may be more difficult that it initially appears. 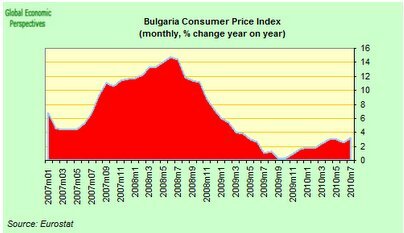 In the first place, Bulgaria operates a currency peg with the euro, yet during the boom years the country had very high inflation rates. As a result a sharp loss in competitiveness occured, a loss which, as the IMF point out, was not accompanied by any substantial corresponding productivity gain. The other evident consequence of this loss of competitiveness was that the country developed a trade deficit, a deficit which though it has reduced following the collapse of imports still exists. In order to return to sustainable (export lead) growth, this deficit needs to become a surplus. Growth during the boom years was driven by large capital inflows that fueled strong growth in the non-tradable sector. As future capital inflows are likely to remain at a level well below that of the boom years, with growth in the non-tradable sector remaining weak at best, future growth will only be rebound if the tradable sector takes over as an engine of growth. And with lower investment, the robust employment growth the country saw during the years 2001–08 will be difficult to reproduce. Much of the strong employment growth was driven by strong growth in the non-tradable sector. Total employment rose by 20 percent during this period, and three quarters of this came from the construction, real estate, wholesales and financial service sectors. So the country (like so many others in the East and South of Europe) must now make a major shift from non-tradeables to tradeables, and this in the context of a currency peg (and a significant level of external indebtedness) is not going to be an easy task. Bulgaria does not publish seasonally adjusted quarter-on-quarter growth numbers, but given that the economy only shrank by 1.5% year-on-year (according to the flash estimate published by the statistics office on August 13), which was the lowest figure recorded since the country entered a recession in the first quarter of 2009 (and down from an annual drop of 5.9% in Q4 2009), the economy does at least seem to have stabilised. As for the details agriculture contributed to the improvement, with an increase of 1.6 per cent year-on-year, while the services and industrial sectors only declined by 1.7 per cent and 0.3 per cent, respectively. Private consumption, which was one of the main drivers of economic growth in earlier years, was down an annual 7.6 per cent for the quarter, while investment was 1.4 per cent lower. So there has been no real improvement in private consumption, nor should we expect to see any in the near term. Retail sales seem set on a long steady downward path (similar to that seen in other countries in the region with declining populations) and again, this is unlikely to turn around in any sustained way. Domestic demand is likely to remain flat to downwards for some considerable time, as the numbers for household and corporate borrowing (which are not moving upwards at all) tend to confirm. Despite an increase in exports (up 11.4% on the year) and continued decline of imports (down 1.2%), the trade gap for the second quarter was expected to be 4.2 per cent of GDP. 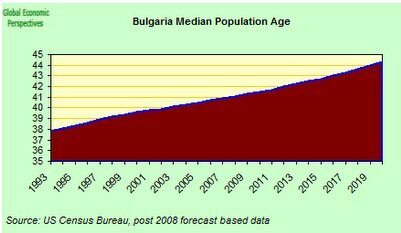 As the IMF stress, potential growth in Bulgaria is surely set to decline further in the longer term, since as I keep saying Bulgaria faces a serious ageing population problem. The median age is now through the critical 40 barrier, and headed on up towards the 45 range, in a country where male life expectancy is some 10 years below the West European average. 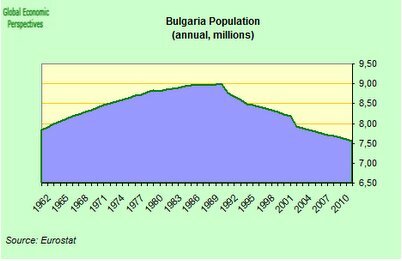 Bulgaria's population has been falling for a decade now, and is projected to decline by a further 28 percent between 2008 and 2060, while the old age dependency ratio would exceed 60 percent in 2060. This population drop is already affecting the working age population, which is already in decline, and is forecast to fall by an additional 25 percent over the next 50 years. As a result, the EU 2009–12 Convergence Programme is forecasting a steady decline in potential growth to an annual 0.3 percent in 2050, and this meagre growth is only obtained by assuming a - totally unrealistic (in what will then be such an old population) - labour participation rate of 70 percent. Personally, I think these numbers are way, way to optimistic, and all of this is badly in need of a current calibration based on what is already happening in ageing societies like Germany and Japan. 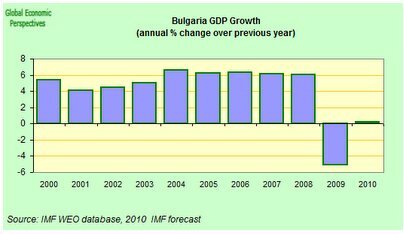 Bulgaria's sustainable growth rate doesn't start to get affected in 2050, it is already on its way down now. 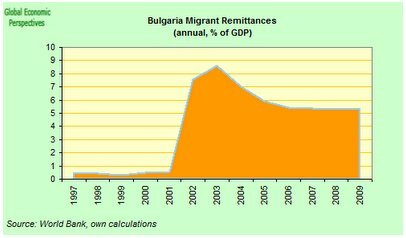 And Bulgaria has another handicap: the large number of Bulgarians who now live and work abroad. The worrying thing is that we don't know how many such workers there are, since the migration data from Bulgarian statistics hardly acknowledges they exist (same situation in Latvia, see this study), using the argument that only those who officially inform them they are emigrating count as migrants. So how do we know they exist? We know they exist because these migrants send home remitances, and the World Bank attempts to track them. According to World Bank data (and my calculations), migrants sent home remittances to the order of an estimated 5.3% of GDP in 2009. Not small beer this at all. And we also know from the national data of resident foreigners in other countries that large numbers of Bulgarians habitually live and work away from their homeland. According to the Spanish INE, there were some 170,000 Bulgarians registered as living in Spain on 1 January 2010, and the Italian Statistics Office (ISTAT) report 41,000 Bulgarians resident in Italy in 2008. But what, you may ask is a country with rising external debt (the IMF is assuming the CA deficit continues to 2015, at least)and falling and ageing population doing exporting its workforce? A good question. And why is no one seemingly concerned about this issue? Another good question. And why are neither the EU Commission and the IMF raising the problem in their respective studies of the country. Oh, there are no shortage of questions here. So, Bulgaria as a country is certainly not short of problems. What with the evident demographic ones, and the limitations of the currency peg, it is hard to see how they are easily soluable. 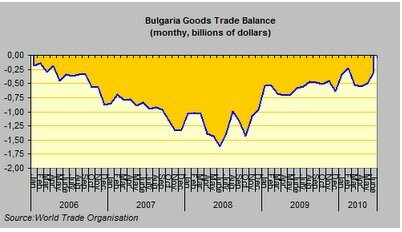 To put it bluntly, Bulgarian industry only accounts for some 18% of GDP (in value added terms). 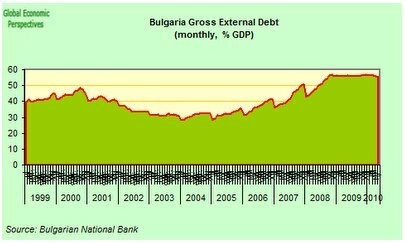 If we assume as a rule of thumb that about 50% is geared to the domestic market, then this means that Bulgarian GDP is going to have to leverage itself forward through growth in about 10% of its output, while other sections shrink. A difficult, if not impossible task. And there are more problems. 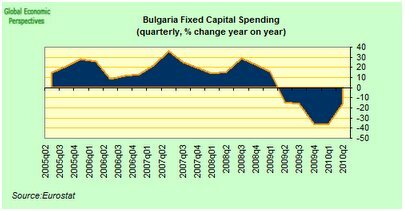 As the IMF point out, Bulgaria's fiscal situation is challenging, since the earlier revenue boom has come to an end, while expenditure pressures are considerable. 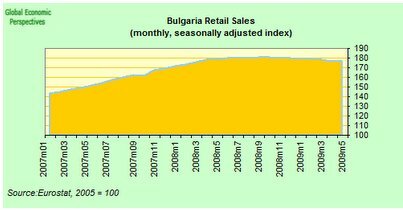 The pre-crisis revenue boom, was fuelled by higher receipts on goods and services on the back of Bulgaria's rapid domestic demand growth, but returning to pre-crisis revenue levels will be a major challenge, not only because the economy is expected to recover slowly but also because the growth pattern will need to shift, with less contribution from domestic demand and more contribution from the external sector, which will result in lower tax revenues. Put simply, since Bulgaria's treasury is stongly dependent on VAT, and exports evidently don't attract VAT, the situation becomes even more difficult.